Strategy games tend to age horribly. It’s not so much the visual side of things - because let’s fact it, strategy games have very rarely been leading visual experiences anyway. No, what makes the strategy genre one that ages horribly is a game’s ability to crunch numbers in the background, and the engine’s ability to juggle statistics and processes. The more modern the strategy game, the better and more complex the AI, and the more mechanics, options, and systems are available to the players. Related reading: Another classic strategy game well worth playing is Civilization 2. Matt's piece on that game. Modern strategy games balance field tactics with complex economic and diplomacy systems, layering one spreadsheet over another in the background and crunching some incredible data sets in the process. Even when the games look relatively primitive, such as something like Europa Universalis IV, you’re going to want a pretty robust PC in order to keep all that mathematics chugging along at a decent rate. And, as these strategy games have become more complex, it is difficult to go back to the relatively limited examples of the genre from yesteryear. With that being said, it’s also fun to chart the heritage of genres, and in the strategy genre, Defender of the Crown is very, very heritage. First released back in 1986 on the Commodore Amiga, it was an odd strategy game in that, at the time, it was actually lauded for its visuals. Of course those have since aged, and while the game was initially a resounding success, the relatively limited nature of the gameplay has made it a game that has steadily declined in people’s estimation. However, there are elements of what would become the 4X genre that is so beloved today, and, back then, the slightly broader focus than the battlefield strategy was quite appealing. 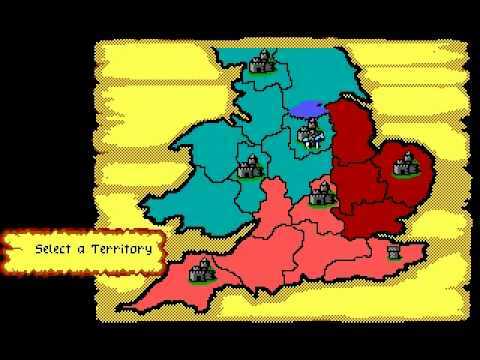 At a basic level Defender of the Crown was a strategy game like the classic board game, Risk, focused in old England as Saxon hordes roamed and knights in shining armour were a romantic idea. It was like Risk in that he who had the larger armies was likely to dominate. In order to build up armies quickly you’d need to capture as many territories as quickly as possible, as each new territory granted you additional income each turn, and then use that money to recruit armies and build fortifications. Meanwhile, of course, your rivals were doing the same thing, and as England’s a rather small place it doesn’t take long for empty territories to run out. At that point it’s time to start fighting, nation to nation, for ever greater empires within England. Play well and make sure you have enough forces to repel the attacks of your rivals and eventually you’ll get to attack the castles of your opponents. At that point catapults come into their own, as expensive as they are, but winning that battle puts you in a dominant position by adding a major territory to your own. Combat played out on auto, though it was possible to select from a couple of different strategy options in real time. It was, of course, frustrating watching the invisible dice rolls go against you, and your unit of well-armoured knights fall to peasant soldiers more rapidly than they should have, but these were offset by the luck of those same dice giving you a win from behind at times. There was very little strategy involved in this combat, however. There was no way to improve the performance of your units through equipping them better or training them, and there were no provisions for terrain, supply, and veteran soldiers. So, for the most part, as I said earlier, he who had the bigger force was likely to be overwhelming. Something that did add a little strategy to the proceedings was that you could only have one “attacking” unit in play at a time. Only your king-knight could lead an attack, and obviously he could only be in one place at a time. You could leave soldiers in other territories to defend it from attacks, but doing well at Defender of the Crown did rely heavily on you having that “main” army in the right place at the right time. There were some light diplomacy functions, too, both represented in-game through a minigame. It was possible to participate in jousts (at least, until you kill an opponent’s horse by accident), and then go on a mission to rescue a damsel in distress. 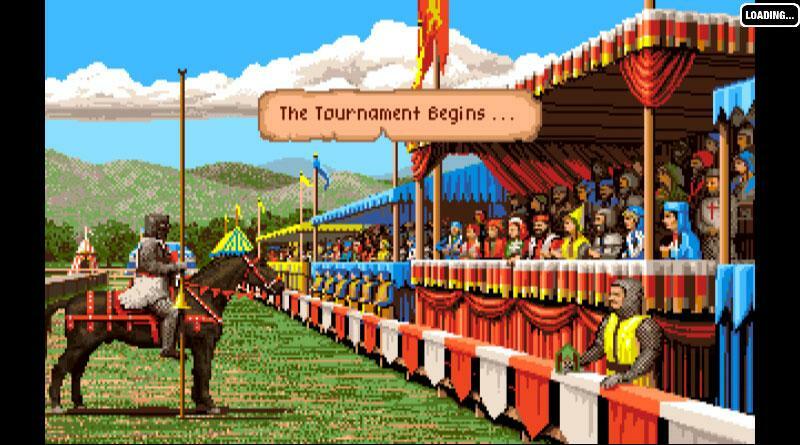 These minigames weren’t particularly great, but in the context of the broader game, they were perfect in helping to set the scene and really give the whole experience a distinct “King Arthur”-like atmosphere. One further option was to drop into old mate Robin Hood and ask for some assistance from him. For me, what I like about 4X strategy games, as opposed to tactics or RTS strategy titles, is the stuff that you’d get up to outside of combat. Building up armies, fortifying what land you’ve got. Playing the diplomacy game to make allies so you don’t need to worry about attacks from all angles. While Defender of the Crown isn’t really a 4X game, since some of the features of 4Xes, such as trading and science development, are not present, in a very abstract sense this was a game that wanted to be more than just territory conflict and conquest. Related reading: The greatest ten strategy games ever. EVER. 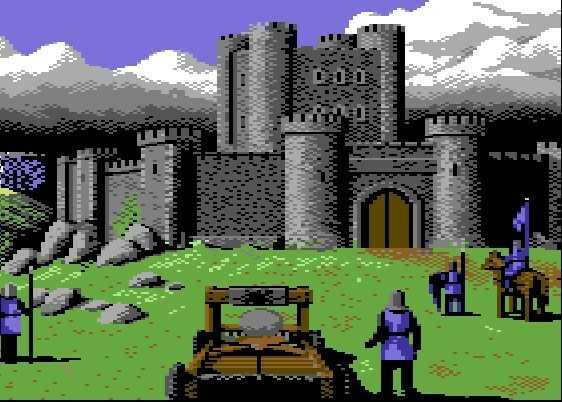 For the curious, Defender of the Crown is readily available on GOG and other platforms. It’s also available on a number of older consoles - for example there’s a Game Boy Advance version. As I said at the start, this is a game that has aged horribly, but if you’re curious about one of the most important early strategy games, it’s well worth giving this a whirl.